The Moderna set has a glossy, durable powdercoat finish, with gooseneck accents in silver. 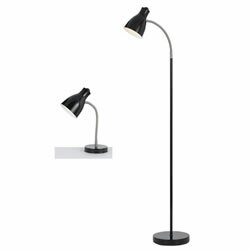 The gooseneck allows both table and floor models to position light where it is needed. Both models have on line switches. Simple assembly required.